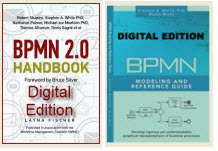 Pay only $69.95 for both BPMN books in one bundle. You Save $45.00. Quality laminated hardcover. Illustrations, charts, references, appendices, bibliography, index. Learn more about the Global Excellence Awards including rules, submissions and deadlines. The criteria for the case studies in this book. Innovation encompasses the innovative use of technology for strategic business objectives; the complexity of the underlying business process and IT architecture; the creative and successful deployment of advanced workflow and imaging concepts; and process innovations through business process reengineering and/or continuous improvements. Hallmarks of a successful implementation include extensive user and line management involvement in the project while successfully managing change during the implementation process. Factors impacting the level of difficulty in achieving a successful implementation include the system complexity; integration with other advanced technologies; and the scope and scale of the implementation (e.g. size, geography, inter-company processes). Impact is the bottom line, answering the question "what benefits do imaging and workflow deliver to the business?" Examples of potential benefits include: productivity improvements; cost savings; increased revenues; product enhancements; improved customer service; improved quality; strategic impact to the organization's mission; enabling culture change; and-most importantly-changing the company's competitive position in the market. The visionary focus is now toward strategic benefits, in contrast to marginal cost savings and productivity enhancements. To add depth and meaning to the case studies, leading industry analysts and experts were invited to contribute chapters from their respective perspectives. The introduction is by Connie Moore, leading industry analyst and Vice President with Giga Information Group, and Excellence Awards judge, jointly with Gig Graham, Chief Research Officer, Giga Information Group. Here, they watch a new trend in the way an enterprise delegates and manages business processes in its extranet, and a new role for workflow technology within organizations. One of the revolutionary concepts made possible by the Internet is "electronic value chains" of carefully sequenced insourced and outsourced business processes for delivering and servicing products. In economic terms, the Internet enables the disaggregation of internal processes and reaggregation of specialists into a modern workflow, often at new price points or with higher-quality products. Martin Ader, Principal of Workflow & Groupware Strategies, France, and author of the highly acclaimed Comparative Analysis of Workflow Products, looks at how the development of the Internet, coupled with the development of technologies for Knowledge Management and Work Management, will have deep influence on the way economic actors play their role in the worldwide market place. This will lead to the development of a new form of economic undertaking, the "Virtual Enterprises" where sets of economic actors are associating their strengths to provide a specific service traditionally provided by a single enterprise. Such a possibility will have, in the long term, deep influence on the economy and enterprise development strategies. 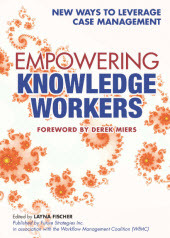 This chapter shows how this can modify the way work can be organized and conducted, and demonstrates how those effects enable competition between virtual enterprises and traditional ones, and gives an overview of the conditions to make it happen. Derek Miers, Principal, Enix Consulting Ltd., England, offers excellent advice to business leaders who must make critical decisions regarding the development of the next generation of Web-based enterprise application systems, e-commerce products and Web-based services targeted at the business sector. The key point he makes is that building and maintaining an effective support infrastructure for business processes have become a technologically demanding task with relatively high costs attached. More importantly, the capability of the firm to rapidly bring products to market is significantly inhibited. On the other hand, embedding robust process oriented components within Web-based applications will speed the time-to-market and lower the cost of ownership. Unless developing process support engines for the Web is a core capability of your company, embedding a product architected for that environment will deliver a much higher return on investment than in-house development, while also ensuring that products and services are brought to market more quickly and effectively. Priscilla Emery, Senior Vice President, Association for Information and Image Management International (AIIM), presents some of the results of AIIM's annual worldwide study and provides a status of the document technologies marketplace, from both a user and a supplier perspective. In 1999, AIIM requested that GartnerGroup conduct this study. The resulting information provides insight into the growth of the different document technology areas, the reasons for that growth and some of the issues that both suppliers and users consider the most pressing in this area. Workflow is one of the document technology areas that were examined. This chapter summarizes the findings of the market research as they pertain to workflow technology and trends. Blue Cross & Blue Shield of South Carolina (Columbia, SC) Their military health claim operation was a very paper intensive process and a very cost competitive business. BCBSSC's high claims volumes of over 500,000 claims in process with more than 100,000 new claims added daily impacted their ability to meet service level and cycle time minimums for processing claims according to government contract requirements. A unique add-on product allocation allows them to facilitate high volume distribution of claims records and images using a "push" methodology, yet gives supervisors the ability to redistribute work on an exception basis as needed and on demand. Nominator and integrator is Syscom, Inc, and with software solutions provided by IBM Corporation. Finalist, Workflow/ Process Management. Detroit Edison Finalist, Document/Knowledge Management DE generates over 46 million kilowatt-hours annually with eight fossil plants and one nuclear facility and is Michigan's largest electric utility serving two million electric customers in 7,600 square miles. Because of the need to access over 300,000 easement documents and 4,000 owned property records, they implemented the Corporate Real Estate Services (CRES) Database/Imaging System to automate the process of file retrieval and to protect these easement agreements (some of these fragile documents were acquired before the year 1900) from catastrophic loss. Nominator is Eastman Software Inc.
Zurcher Kantonalbank, (Zurich, Switzerland) ZKB is the third largest bank in Switzerland. In a world of growing global banking competition, the ZKB acted upon its vision of rationalizing work and efficiency. The ZKB initiated a FIT policy for industrializing business management and production, and automating banking processes. A workflow system was installed to manage processing tasks in a centralized Securities Administration Department. The sub-department of Bonds Redemption was the first workflow project, and it is currently in production. Finalist, Workflow/Process Management. · The number of users currently on the system and number of users planned. · How the company has been impacted by their new system; cost savings, ROI and increased productivity improvements, competitive advantage gained, and how they managed to move the goal posts for their industry. · Their implementation process and methodology, the project team, and the change management and business process reengineering issues they addressed. · How these companies managed both their overall technological and business innovations. What does that BPM acronym mean? This new eBook series presents the collection of best and most important chapters on their respective topics recently published in the annual BPM and Workflow Handbook series and other publications. Could your case study be an Award-winner? Get recognition for your vision and your team's achievments. 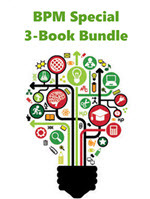 Download THREE Complete Books in one zipped Bundle for the price of ONE. Read the cream of award-winning Case Studies! © Future Strategies Inc. All rights reserved.